Several photos of this flower were sent to me from Italy taken by my Son in law who retired from the Navy after 20 years of service as Lt. Commander William Roark. I named the flower after him as a tribute. He was a helicopter pilot for the Navy and was stationed in Italy for several years. He was also stationed in Japan and he and my oldest son gave me the opportunity to visit both countries. He now pilots jets in Afghanistan for a private company. 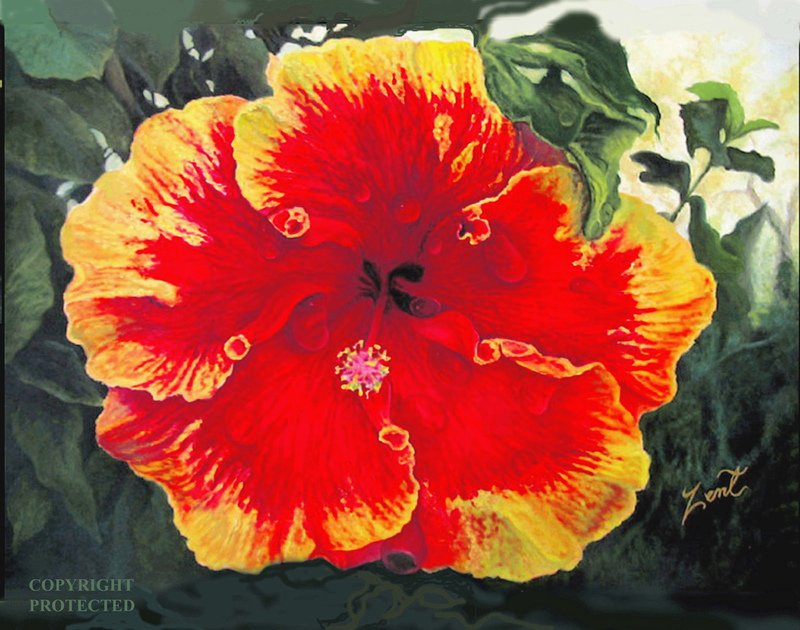 This entry was posted in Original artwork by June Pauline Zent, True Stories About Artwork and tagged art, artwork, floral paintings, gardens, Hibiscus flowers, nature, true stories, word press. Bookmark the permalink. Thank you so much Maggie. so glad that you enjoy it! very bright and full of life June! this combination of hibiscus is rare.we do find many types and colours of them in India..but this one is awesome.. Yes Soumya, that’s why I wanted to paint it because it was so unusual. I am very glad that you enjoyed it! and thanks for the compliments. Neighbors who follow Bill on Facebook all rave of the painting, as if they’ve never seen it before. Gee why? Because they haven’t until now. Good job, mom! Thank you sweetie, I am glad that it has pleased Bill. He deserves the credit more than me. I am glad that you like it also and of course his friends. Love you! Though I haven’t personally seen one of this kind, one of my friend’s Dad is a keen gardener who has a forest in his house. He is a professor in Botany and does experi’mental’ (in his own son’s words) stuff with plants. For the first time, I’ll take a look at his plant/flower forest and see if this one is available. Beautiful.June! If you ever find out where to get one of these, pass the info on to me too. Beautiful Flower, Beautiful Artwork! Thank you so much Manu. I would love to find someone who has one here and it is kind of you to ask your friend. Yes Commander Roark does like the painting. His wife comments above yours. Have a wonderful day! Thank you Stefan; Your comments are always uplifting and I am always glad to see you here. Gorgeous and brightens the mood! Great painting – my congratulations. Thank you Sir. It is always nice to have you come here and compliment. It brightens my day! Absplutely beauyiful! I have never seen one like it either. Is there a posibility you could get one througha flower exchange or a nursery – special order? A amazing flower and photo. Your son is lucky to travel and see the beauty of the Earth. I have a nice morning with this flower! It give me peace and calm sensation. Thank you for your post! Such a great artist! Have a nice weekend, smiles. Thank you Sornia, I am so glad that it helped make a happy morning for you .Your compliments help make a happy morning for me and I am so glad that you took the time to come here. Hope that your weekend is wonderful and (smiles) right back at you!